 Tågset typ SBB/CFF/FFS "Coop"
Denna produkt ger dig 3207 bonuspoäng. Tågset typ SBB/CFF/FFS 'Coop', totallängd över buffertar 361 mm, epok VI. Diesellok klass Re 460, loket har digitaldekoder och ljudmodul, motor med svänghjul, drivning på 4 axlar, slirskydd, ljusväxling i färdriktningen. Prototype: Swiss Federal Railways (SBB/CFF/FFS) class Re 460 fast general-purpose locomotive. Advertising locomotive for the Swiss retailer COOP. Locomotive road number: 460 083-9. Two type Sgns container flat cars loaded with refrigerated containers for the firm COOP, used on the Swiss Federal Railways (SBB/CFF/FFS). The train looks as it did in 2015. Model: The locomotive has a built-in digital decoder for operation with DCC, Selectrix, and Selectrix 2. The locomotive's motor has a flywheel. 4 axles powered. Traction tires. The headlights and marker lights change over with the direction of travel. Warm white LEDs are used for lighting. The locomotive has an NEM coupler pocket. 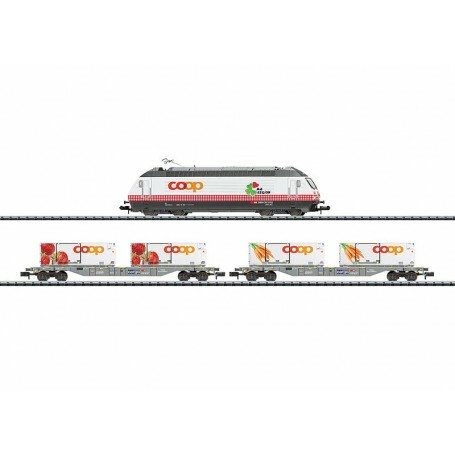 Two container flat cars have close coupler mechanisms and are each loaded with 2 COOP refrigerated containers lettered 'Erdbeeren' (strawberries) and 'Karotten' (carrots). Total length over the buffers 361 mm / 14-3/16'. Highlights: Swiss headlight / marker light changeover. Many sound and control functions. Warm white LEDs for headlights. COOP refrigerated containers are new tooling. T11638 SBB Class Re 460 'Coop' Electric Locomotive On March 3, 2014, shortly after 11 AM, the SBB's new advertising locomotive, road number Re 460 083, had its big appearance in the Basel SBB station, because around thirty people waited with excitement for the arrival of 'their' locomotive. These people were not the usually passengers, rather special guests of Coop CEO Joos Sutter. The train was a special train for the maiden run of the new Coop advertising locomotive 'Miini Region'. From that point on, it was supposed to be the mobile messenger for the new Coop seal of quality of the same name. This new seal stands for regional products that are grown and produced in the vicinity. The locomotive is handsome in its white paint scheme with red/white checked stripes down to the frame to set off the locomotive. It shows only the lettering 'coop' and the 'Miini-Region' emblem on all sides. However, the nickname 'Table Cloth' was soon being applied in this scene for the locomotive. Road number Re 460 083 comes from a series comprising 119 units (Re 460 000-118), placed into service by the SBB between 1992 and 1996. As early as the start of the mid-Eighties the SBB had worked intensively on the purchase of a new electric locomotive with three-phase propulsion, which was intended for the project 'Bahn 2000' / 'Railroad 2000'. The SBB therefore had the in-house suppliers at that time ABB in Oerlikon and SLM in Winterthur develop an appropriate unit, which was quickly designated as Locomotive 2000 officially as the class Re 460. The result of the specifications was a general-purpose high-speed locomotive with a maximum speed of 230 km/h / 144 mph and a performance of 6.1 megawatts / 8,177 horsepower, which was designed for express and freight train service. A ribbed lightweight locomotive body had to be designed in order not to exceed the total weight of 84 metric tons. The design studio Pininfarina was responsible for the shape of the design. A three-phase asynchronous motor drove each wheel set in the trucks. A traction rectifier with GTO thyristors supplied the traction motors of each truck with the necessary traction current. The Re 460 locomotives were equipped with radially adjustable wheel sets in order to keep wheel wear as low as possible on the (Alpine) routes with their many curves. New territory was the control technology, because control electronics were installed for the locomotive as well as for the propulsion. The well-proportioned side walls quickly made the Re 460 locomotives into advertising mediums for all types of institutions and the retail firm Coop finally came to make use of this locomotive.